Two very nice tokens, with also two very different styles. Pity that the designer of the last token did not realize that you should not put protruding letters on a protruding edge rim because that is prone to wear much quicker. There is an interesting story regarding how the J. Henry issue came about. Mathew Young had designed a token die that broke after the second impression. He replaced this with a new die but unfortunately he died before any tokens were struck. J. Henry next acquired the die and it was altered it to advertise his own name, [many years later] One hundred impressions in bronze and twelve in silver were made and sold at 5/- and one guinea respectively; the die was then softened and used as a paper weight. He then made a second variety, the one above, using a similar reverse as the obverse and a new reverse - that shown above. This second common type he sold at sixpence each. The first obverse is shown below, dated 1879. With the return of the army that had fought Napoleon from Portugal to Waterloo, Britain was struggling with a post-war recession, made worse by counterproductive economic policy. A wave of crime followed, ensuing a period of judicial terror, with weekly multiple hangings in London alone. If anything, this period created the upstairs-downstairs society. These medals represent upstairs. The part of society that had a model of the battle of Waterloo in a spare room. Napoleon (building on a tradition enhanced already by Louis XIV) had taken the medal from a shilling-sized, thin brass piece to a crown sized, thick bronze piece, using them for personal propaganda. The British answer was similar, but lighter. It remained popular after Napoleon's demise, largely by turning to the British royal house. As the Napoleonic wars faded in the collective memory, medal makers struggled for survival. Some went for the low part of the market, creating "educational" bonuses for buying magazines or some such (not unlike the petrol company medals of the 1970s and 80s), others went for the high end, with artsy stuff and self-propaganda, not unlike Napoleon before. My guess is these two medal makers were going after the high end. 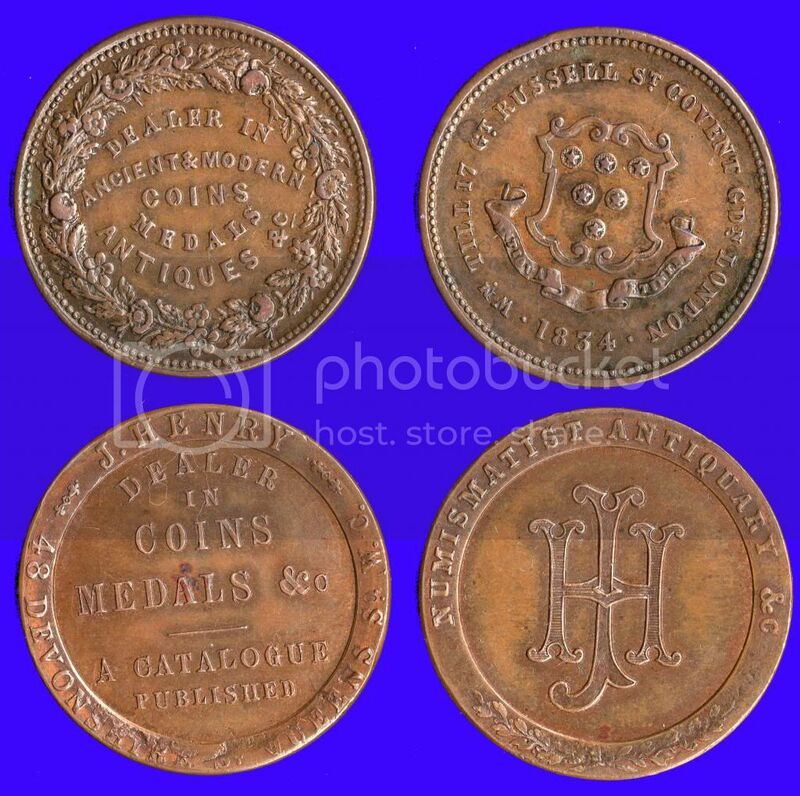 These are of course advertising medals (much like the key hangers and shopping cart tokens of today), but they look relatively expensive. You can imagine deals where jewellers would include them in the box with jewels bought, or drapers would include them with new clothes. They would have been new and shiny, looking attractive for a short while but cast aside when they started corroding until those horrid socialist would come and tax the family out of their stately home. Till died in 1844. His stock/collection was sold post-mortem in four parts at Sothebys on 6/1/1845, 28/7/1845, 20/4/1846 & 12/5/1846 plus the library went on 15/5/1846. The coins fetched £2,750/18/6 and the books £119/18/-, Must have been quite a collection! Another from Ebay, could this be from a younger Wm Till? Yes this is indeed the same William Till, but he was not younger, he had made these tokens to sell to unsuspecting collectors in about 1840. 'An exceeding fine pattern for the halfpenny token of Slough, Bucks, "John Peckham Chemist and Druggist," engraved for his friend William Till, Medalist, by Taylor: only 15 of these pieces were struck off when the dies broke.' These pieces are to be regarded as interesting frauds. Till produced another forgery about 1819, on one side was the design of a dancing man and an ape, and on the other a gallows with the legend END OF PAIN (D&H Middlesex 836) see p. 67. This piece exploited the publicity arising from Cobbett bringing Thomas Paine's body back to England. Another nineteenth century fraudulent token (Till) below. I had a look at the eBay page, I see the edge of this piece is very battered, rather a shame. The same dealer does however have a perfect example of the J. Henry token. Being made only for collectors the raised legend normally would not be a problem as they were never intended for circulation. Just read p. 67 before putting the book away, here is a scan of the relevant piece.